"Out of the primordial depths to destroy the world!" Other Stars: Ian Keith, Dean Maddox Jr. It Came From Beneath the Sea marks the second major film effort for visual effects master Ray Harryhausen, who pretty much revolutionized how film effects were thought of and done. He did this, of course, with his landmark, breakthrough picture 20 Million Miles to Earth, which featured some of the most impressive stop-motion effects seen up to that point. Unfortunately, It Came... is something of a minor blip in the career of Harryhausen and his collaboration with producer Charles H. Schneer, not because of the low profile of Harryhausen's work, but rather because the movie itself isn't as memorable as his other work. The premise is relatively straightforward: in the new age of atomic submarines, mankind thinks that the sea can no longer offer them new challenges. However, during a test run, one particular U.S. Naval submarine (commanded by actor Kenneth Tobey) runs into something that almost destroys it. 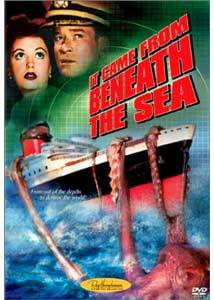 Weeks later scientists (aided by one Faith Domergue) come a conclusion: that this "something" the sub encountered was a gigantic octopus, apparently forced to the surface of the ocean by radioactive poisoning at the sea floor from H-Bomb tests. At first the military doesn't want to accept this explanation, but eventually they must when the octopus leaves behind live witnesses after it attacks another vessel at sea. So, the best atomic submarine is set to the eventual task of hunting down the creature and destroying it, despite the immense risk. Eventually, however, this leads to a full military preparation for the monster to attack on land in (where else but) California. Like many monster stories of this time, there is a very obvious radiation comment here, in an age when radiation wasn't considered nearly as dangerous as it is today. What weakens It Came... as any kind of interesting monster flick is the amazingly sluggish pace with which it presents the story, then further slows it down with a clumsy and extremely dated romantic sub-plot involving Domergue and Tobey, that for a good portion of the film seems to overtake the fact that there's supposed to be a giant octopus lurking around somewhere. When the action does pick up, it's only for a brief while in the third reel, and the action is pretty predictable. While 1950s-era sci-fi movies were often like this, they certainly didn't have to be. They could often be mentally engaging while still having a fairly basic, commercial storyline. While Harryhausen's effects are top-notch, the octopus is conveniently battled largely off-camera, in tense sub battles which, though interesting, lack thrill. The climax comes when the octopus comes through the Golden Gate and starts wreaking havoc (a scene so realistic at the time that many believed the actual bridge was used in the effects). Like so many '40s and '50s sci-fi B pictures, this one just doesn't get interesting until it's getting ready to end, and that's mostly thanks to the small budgets. Image Transfer Review: Transferred in its original 1:85:1 aspect ratio, the film looks surprisingly good for its age and marks another pleasant black & white transfer for Columbia of one of their classics. The negative has some damage here and there, but it is minimized and the fine-grain is brought out nicely for an effective image. Granted, there's little in the way of cinematography to admire and most of the outdoor locations were done with back-projected studio work, but the black level and over all shade balance could have been disastrously dark and murky. Audio Transfer Review: The original English mono is slightly expanded into a 2-channel mix that is not stereo, simply refocused. There are no issues to complain about, except an occasional pop or hiss, but obviously there's not much to praise either. For the age, the mix manages to work perfectly at a decent, mid-level volume, but turning it up too loud won't result in a sonic experience, just distortion. Extras Review: The extras are pretty much identical to those on other Ray Harryhausen Collection discs. Once again, The Harryhausen Chronicles documentary is presented and is hosted by director/writer Joe Dante. It's a great piece, but it's also the third time it's appeared on a Harryhausen Collection disc. The original This Is Dynamation trailer is presented, which was originally used as a teaser for The 7th Voyage of Sinbad and, again, it has appeared many times before on Columbia discs. The package and menu design is nice, but not over-the-top, and the whole package looks new, while still keeping some old artwork and style. When compared to other works in the Harryhausen/Schneer collaborative years, It Came from Beneath the Sea strikes me as being a bit short of the mark. The heady, scientific approach that we see in masterpieces like 20 Million Miles or Earth vs. the Flying Saucers isn't quite there, and the low budget actually hurts the overall impression. Worth viewing from a historical perspective, but Harryhausen's best work was yet to come in his color masterworks like the Sinbad films.